Consumer technology has lacked a wow moment recently. But flexible screens and four other promising advances could eventually lead to cool new devices. Smart watches are the newest "new thing." Having your watch connect to your smartphone and notify you when you get an e-mail, text or change in the score of the game you're paying attention to is a neat idea. But wouldn't it be more useful to just wear your smartphone around your wrist? Prototypes of bendable displays have existed for years, and big smartphone companies like Nokia (NOK) and Samsung, as well as glass makers like Corning (GLW) are intent on making them a reality. 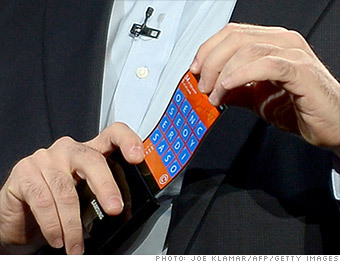 Apple (AAPL) also applied for a patent for a device with a flexible, wrap-around display that you could wear as a sleeve. The technology is too expensive and impractical for consumer gadgets today, but Corning said at this year's Consumer Electronics Show that it expects its ultra-thin, rollable Willow Glass to appear in smartphones within the next several years.